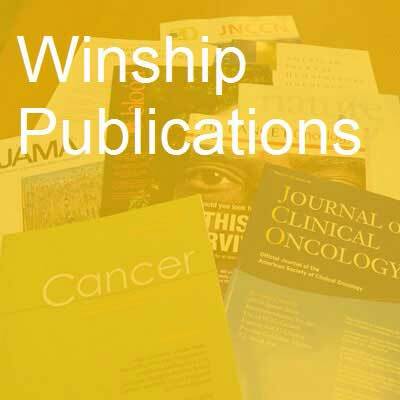 A number of first authors and senior authors from Winship Cancer Institute have published over 40 studies in major medical and scientific journals in the past month. Patient's lung cancer diagnosis as a cue for relatives' smoking cessation: evaluating the constructs of the teachable moment. McBride CM, Blocklin M, Lipkus IM, Klein WM, Brandon TH. Psycho-oncology. 2015; PubMed PMID: 26514587. Fatigue is Associated with Inflammation in Patients with Head and Neck Cancer Before and After Intensity-Modulated Radiation Therapy. Xiao C, Beitler JJ, Higgins KA, Conneely K, Dwivedi B, Felger J, Wommack EC, Shin DM, Saba NF, Ong LY, Kowalski J, Bruner DW, Miller AH. Brain, behavior, and immunity. 2015; PubMed PMID: 26515035. The Meaning of Race in Prostate Cancer Treatment. Brawley OW. JAMA oncology. 2015; :1-2. PubMed PMID: 26502032. Producing Evidence to Reduce Low-Value Care. Howard DH, Gross CP. JAMA internal medicine. 2015; :1-2. PubMed PMID: 26457957. Cancer statistics: Breast cancer in situ. Ward EM, DeSantis CE, Lin CC, Kramer JL, Jemal A, Kohler B, Brawley OW, Gansler T. CA: a cancer journal for clinicians. 2015; PubMed PMID: 26431342. Identifying racial differences in nodular lymphocyte-predominant Hodgkin lymphoma. Flowers CR, Nastoupil LJ. Cancer. 2015; 121(19):3387-3389. PubMed PMID: 26149195. Out-Of-Pocket Prescription Costs Under A Typical Silver Plan Are Twice As High As They Are In The Average Employer Plan. Thorpe KE, Allen L, Joski P. Health affairs (Project Hope). 2015; 34(10):1695-703. PubMed PMID: 26438746. Hypothyroidism after cancer and the ability to meet reproductive goals among a cohort of young adult female cancer survivors. Chin HB, Jacobson MH, Interrante JD, Mertens AC, Spencer JB, Howards PP. Fertility and sterility. 2015; PubMed PMID: 26474733. The current state of eukaryotic DNA base damage and repair. Bauer NC, Corbett AH, Doetsch PW. Nucleic acids research. 2015; PubMed PMID: 26519467. Bayesian inference with historical data-based informative priors improves detection of differentially expressed genes. Li B, Sun Z, He Q, Zhu Y, Qin Z. Bioinformatics (Oxford, England). 2015; PubMed PMID: 26519502. Preclinical in vitro, in vivo and pharmacokinetic evaluations of FLLL12 for the prevention and treatment of head and neck cancers. Anisuzzaman A, Haque A, Rahman MA, Wang D, Fuchs JR, Hurwitz SJ, Liu Y, Sica GL, Khuri FR, Chen ZG,Shin DM, Amin AR. Cancer prevention research (Philadelphia, Pa.). 2015; PubMed PMID: 26511491. Another look at the informed consent process: The document and the conversation. Wall LK, Pentz RD. Cancer. 2015; PubMed PMID: 26505483. LKB1 promotes cell survival by modulating TIF-IA-mediated pre-ribosomal RNA synthesis under uridine downregulated conditions. Liu F, Jin R, Liu X, Huang H, Wilkinson SC, Zhong D, Khuri FR, Fu H, Marcus A, He Y, Zhou W. Oncotarget. 2015; PubMed PMID: 26506235. A novel prediction model for human papillomavirus-associated oropharyngeal squamous cell carcinoma using p16 and subcellular Î²-catenin expression. Qian G, Hu Z, Xu H, MÃ¼ller S, Wang D, Zhang H, Kim S, Chen Z, Saba NF, Shin DM, Wang AY, Chen ZG. Journal of oral pathology & medicine : official publication of the International Association of Oral Pathologists and the American Academy of Oral Pathology. 2015; PubMed PMID: 26493274. Characterization of Lamprey IL-17 Family Members and Their Receptors. Han Q, Das S, Hirano M, Holland SJ, McCurley N, Guo P, Rosenberg CS, Boehm T, Cooper MD. Journal of immunology (Baltimore, Md. : 1950). 2015; PubMed PMID: 26491201. Correlation between apparent diffusion coefficients and HER2 status in gastric cancers: pilot study. He J, Shi H, Zhou Z, Chen J, Guan W, Wang H, Yu H, Liu S, Zhou Z, Yang X, Liu T. BMC cancer. 2015; 15(1):749. PubMed PMID: 26487555. 6-Phosphogluconate dehydrogenase links oxidative PPP, lipogenesis and tumour growth by inhibiting LKB1-AMPK signaling. Lin R, Elf S, Shan C, Kang HB, Ji Q, Zhou L, Hitosugi T, Zhang L, Zhang S, Seo JH, Xie J, Tucker M, Gu TL, Sudderth J, Jiang L, Mitsche M, DeBerardinis RJ, Wu S, Li Y, Mao H, Chen PR, Wang D, Chen GZ, Hurwitz SJ, Lonial S, Arellano ML, Khoury HJ, Khuri FR, Lee BH, Lei Q, Brat DJ, Ye K, Boggon TJ, He C, Kang S, Fan J, Chen J. Nature cell biology. 2015; PubMed PMID: 26479318. TROP-2 expression in papillary thyroid carcinoma: Potential Diagnostic Utility. Simms A, Jacob RP, Cohen C, Siddiqui MT. Diagnostic cytopathology. 2015; PubMed PMID: 26481593. Parathyroidectomy is safe and beneficial for patients with tertiary hyperparathyroidism, and should be the preferred therapy. Sharma J, Weber CJ. Surgery. 2015; PubMed PMID: 26482174. Evaluating Policy, Systems, and Environmental Change Interventions: Lessons Learned From CDC's Prevention Research Centers. Honeycutt S, Leeman J, McCarthy WJ, Bastani R, Carter-Edwards L, Clark H, Garney W, Gustat J, Hites L, Nothwehr F, Kegler M. Preventing chronic disease. 2015; 12:E174. PubMed PMID: 26469947. CCR 20th Anniversary Commentary: Prospects and Challenges of Therapeutic Nanoparticles in Cancer. Rahman MA, Shin DM. Clinical cancer research : an official journal of the American Association for Cancer Research. 2015; 21(20):4499-501. PubMed PMID: 26473185. Suppression of death receptor 5 enhances cancer cell invasion and metastasis through activation of caspase-8/TRAF2-mediated signaling. Oh YT, Yue P, Wang D, Tong JS, Chen ZG, Khuri FR, Sun SY. Oncotarget. 2015; PubMed PMID: 26510914. Exchange protein directly activated by cAMP encoded by the mammalian rapgef3 gene: Structure, function and therapeutics. Banerjee U, Cheng X. Gene. 2015; 570(2):157-67. PubMed PMID: 26119090; PubMed Central PMCID: PMC4556420. Therapy-related acute myeloid leukemia following radioactive iodine treatment for thyroid cancer. Oluwasanjo A, Pathak R, Ukaigwe A, Alese O. Cancer causes & control : CCC. 2015; PubMed PMID: 26453198. Synthesis, binding affinity, radiolabeling, and microPET evaluation of 4-(2-substituted-4-substituted)-8-(dialkylamino)-6-methyl-1-substituted-3,4-dihydropyrido[2,3-b]pyrazin-2(1H)-ones as ligands for brain corticotropin-releasing factor type-1 (CRF1) receptors. Stehouwer JS, Bourke CH, Owens MJ, Voll RJ, Kilts CD, Goodman MM. Bioorganic & medicinal chemistry letters. 2015; PubMed PMID: 26456805. Thioxo-dihydroquinazolin-one Compounds as Novel Inhibitors of Myeloperoxidase. Li Y, Ganesh T, Diebold BA, Zhu Y, McCoy JW, Smith SM, Sun A, Lambeth JD. ACS medicinal chemistry letters. 2015; 6(10):1047-52. PubMed PMID: 26487910. Mannitol to prevent cisplatin-induced nephrotoxicity in patients with squamous cell cancer of the head and neck (SCCHN) receiving concurrent therapy. McKibbin T, Cheng LL, Kim S, Steuer CE, Owonikoko TK, Khuri FR, Shin DM, Saba NF. Supportive care in cancer : official journal of the Multinational Association of Supportive Care in Cancer. 2015; PubMed PMID: 26446698. Sonic Hedgehog Signaling Drives Mitochondrial Fragmentation by Suppressing Mitofusins in Cerebellar Granule Neuron Precursors and Medulloblastoma. Malhotra A, Dey A, Prasad N, Kenney AM. Molecular cancer research : MCR. 2015; PubMed PMID: 26446920. Chondroitin Sulfate Glycosaminoglycan Hydrogels Create Endogenous Niches for Neural Stem Cells. Karumbaiah L, Enam SF, Brown AC, Saxena T, Betancur MI, Barker TH, Bellamkonda RV. Bioconjugate chemistry. 2015; PubMed PMID: 26440046. Trends, predictors, and impact of systemic chemotherapy in small cell lung cancer patients between 1985 and 2005. Behera M, Ragin C, Kim S, Pillai RN, Chen Z, Steuer CE, Saba NF, Belani CP, Khuri FR, Ramalingam SS, Owonikoko TK. Cancer. 2015; PubMed PMID: 26441041. Pattern of cardiac surveillance among patients with lymphoma receiving anthracycline-based chemotherapy. Hung OY, Brown JR, Dai T, Easley KA, Flowers CR, Parashar S. BMJ open. 2015; 5(10):e008350. PubMed PMID: 26443656. Clinically significant adverse events after major ABO mismatch BMT. Nickel RS, Waller EK, Qayed M, Chiang KY. Bone marrow transplantation. 2015; PubMed PMID: 26437061. STRUCTURAL BIOLOGY. Locking down the core of the pore. Ullman KS, Powers MA. Science (New York, N.Y.). 2015; 350(6256):33-4. PubMed PMID: 26430103. Predicting Length of Stay Following Radical Nephrectomy Using the National Surgical Quality Improvement Program Database. Lorentz CA, Leung AK, DeRosa AB, Perez SD, Johnson TV, Sweeney JF, Master VA. The Journal of urology. 2015; 194(4):923-928. PubMed PMID: 25986510. Click with a boronic acid handle: a neighboring group-assisted click reaction that allows ready secondary functionalization. Draganov AB, Wang K, Holmes J, Damera K, Wang D, Dai C, Wang B. Chemical communications (Cambridge, England). 2015; 51(82):15180-15183. PubMed PMID: 26327521. Atypical Findings on Cervicovaginal Smears Correlate with Cervical Involvement by Malignant Mixed MÃ¼llerian Tumors of the Uterus. Hanley KZ, Oprea-Ilies G, Ormenisan C, Seydafkan S, Mosunjac MB. Acta cytologica. 2015; 59(4):319-324. PubMed PMID: 26315658. Diagnosing acute abdomen in a woman of reproductive age. Shuaib W, Shahzad H, Zaheer A, Alweis R, Vijayasarathi A, Khosa F. JAAPA : official journal of the American Academy of Physician Assistants. 2015; 28(10):22-3. PubMed PMID: 26406174. Impact of remote monitoring and supervision on resident training using new ACGME milestone criteria. Safir IJ, Shrewsberry AB, Issa IM, Ogan K, Ritenour CW, Sullivan J, Issa MM. The Canadian journal of urology. 2015; 22(5):7959-7964. PubMed PMID: 26432965. Progress and Infrastructure for Improved Patient Outcomes of the National Cancer Institute Network Groups. Blanke CD, Curran Jr WJ. Seminars in oncology. 2015; 42(5):679-680. PubMed PMID: 26433548. A 3D Primary Vessel Reconstruction Framework with Serial Microscopy Images. Liang Y, Wang F, Treanor D, Magee D, Teodoro G, Zhu Y, Kong J. Medical image computing and computer-assisted intervention : MICCAI ... International Conference on Medical Image Computing and Computer-Assisted Intervention. 2015; 9351:251-259. PubMed PMID: 26478919; PubMed Central PMCID: PMC4605571. Folate Receptor Alpha Immunohistochemistry in Cytology Specimens of Metastatic Breast Carcinoma. Sheikh UN, Cohen C, Siddiqui MT. Acta cytologica. 2015; 59(4):298-304. PubMed PMID: 26413911.